Fukuroi City in Shizuoka Prefecture is a small town with a population of 87,000. As one of the venues for the 2019 Rugby World Cup in Japan, it is expected around 200,000 spectators from around the world will come to watch matches. The town is involved in a variety of preparations for the World Cup, including stadium renovations, English education to help provide hospitality in English, and rugby lessons for children. Fukuroi City has a focus on policies for supporting raising children, and so its population has been gradually increasing. The legacy that the city would like to see after the World Cup is a more international perspective in its residents, particularly children. 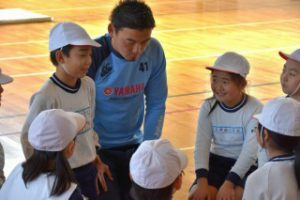 It is hoped the RWC will be an opportunity to help the children develop into adults with an open mind who can communicate with people from around the world. 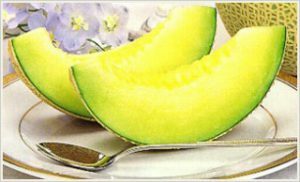 One famous local specialty of Fukuroi is Crown Melons, a premium melon brand. Prices declined after the burst of the economic bubble, with a declining number of children taking over the businesses, but by focusing more on overseas exports prices have stabilized. In response, recently young farmers in their 30s have been returning to take over the family business. It is hoped that the World Cup will be an opportunity to increase awareness of Crown Melons overseas. This press tour will visit the mayor, local elementary school students, and the stadium and accommodations which will be used for the World Cup, to see the preparations underway. 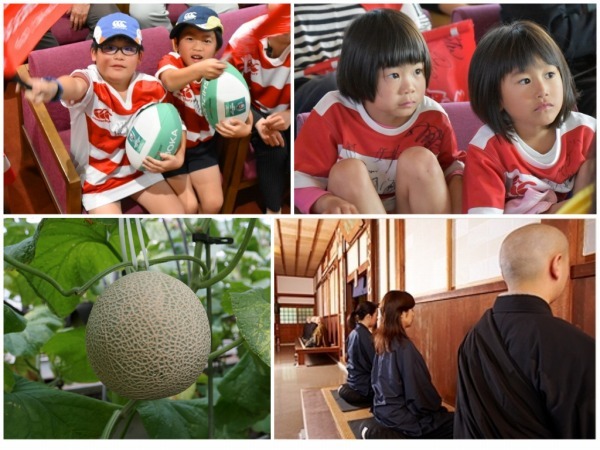 The tour will also visit a producer of the local specialty of melons, and a famous Zen temple providing lessons in zazen meditation and shojin ryori (Buddhist cuisine). One of the venues for the 2019 Rugby World Cup will be Fukuroi, Shizuoka, a city with a population of 87,000. 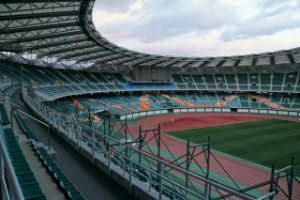 It was also a venue for the soccer 2002 FIFA World Cup hosted jointly by Japan and South Korea, and the infrastructure form that time such as the stadium and roads will be used again for this RWC. Fukuroi City also makes raising children one of its core policies. The initiatives related started 15 years ago, including building daycare centers at preschools and childcare support centers. By continuing support for raising children and attracting businesses to grow employment, the population has increased slightly, with the fertility rate of 1.72% above the national average of 1.42%. 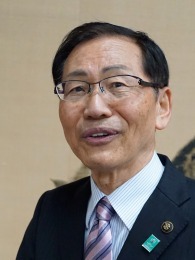 The mayor is hoping that one result of the 2019 RWC will be to make Fukuroi into a more international city, stating, “I want to make it into an event that the children, in particular, will remember.” Using this opportunity of people from around the world visiting the city, he hopes the next generation will have a more global perspective. 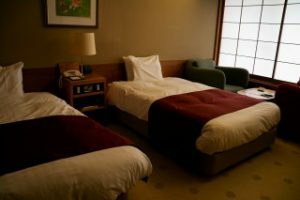 With the goal of providing “hospitality in English” to foreign visitors, the city is putting extra effort into English education for elementary and junior high school students, and has been promoting homestay for foreign visitors at households in the city. ◆The tour will speak with the mayor about the city’s policies in preparation for the Rugby World Cup. 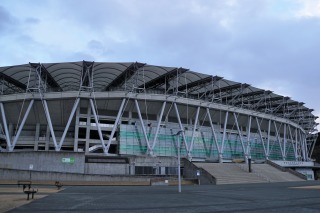 The venue for the Rugby World Cup in Fukuroi will be Shizuoka Stadium ECOPA. The 50,000-seat stadium was built ahead of the soccer 2002 FIFA World Cup hosted jointly by Japan and South Korea, and is located in a verdant, 270-hectare park. The matches scheduled there for the 2019 RWC include strong teams such as Japan, Ireland, Scotland, Italy, Australia, and South Africa. Currently, the stadium’s sound and video systems are being renovated in preparation for 2019. 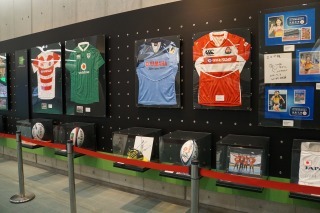 ◆The tour will visit Shizuoka Stadium ECOPA, and hear from city officials about preparations being made by the local government for the RWC, and what benefits they are hoping for from hosting the RWC. The tour will also visit the stadium seating and camera booth, and have the opportunity to film and photograph renovations. 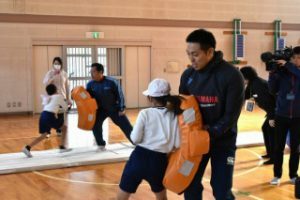 Fukuroi City has been holding rugby lessons at local elementary schools to help locals become familiar with rugby before the 2019 Rugby World Cup. Tag rugby is a new type of rugby that people of all ages can play, with simplified rules and no violent physical contact such as tackling. 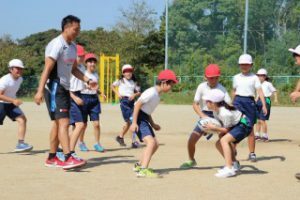 ◆The tour will visit a local elementary school, where a staff member of a local pro rugby team will be giving elementary school students tag rugby lessons. There will also be the opportunity to interview the students and an instructor about their thoughts on hosting the World Cup. 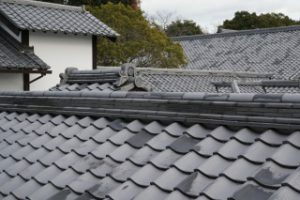 Katsuragi Kitanomaru is a ryokan built in the style of a Japanese castle, by rebuilding seven kominka (traditional Japanese houses) built over 100 years ago. Katsuragi Kitanomaru is run by Yamaha Resort, part of the Yamaha Group (known for musical instruments). 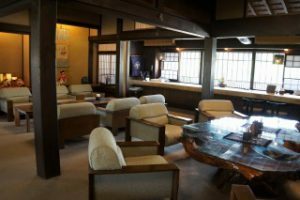 In the 1970s, the chairman of the Yamaha Group at the time learned that the wooden kominka of the Hokuriku region were being forgotten and falling into disrepair, and to ensure they remained for future generations, he moved seven of these kominka to Fukuroi. Construction finished in 1978. Made using valuable wood that can no longer be acquired, the woodworking skill Yamaha developed through its work with instruments can be seen throughout the buildings. The 14 hectares of Katsuragi Kitanomaru have a quiet atmosphere that feels like a different world. 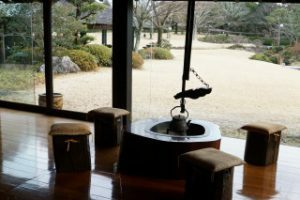 In 2002, the Japanese team’s World Cup soccer coach Philippe Troussier called it “a place where samurai can rest both physically and mentally,” and chose this location for a training camp. ◆The tour will visit Katsuragi Kitanomaru and hear from Yamaha Resort President Mr. Sadatoshi Ando about its unique features and his hopes for the RWC, as well as being able to film and photograph the buildings. 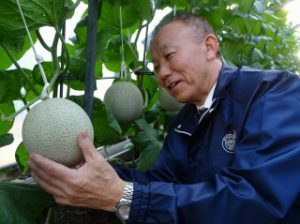 Fukuroi City is well-known in Japan for its greenhouse melons, and with 2,500 tons produced annually is the No.1 producer in Japan. Since melon cultivation began here almost 100 years ago in 1921, new cultivars have been developed in order to create a unique cultivar called Crown Melon, which looks, smells, and tastes good. Advanced techniques are required for their cultivations, such as changing the amount of water used each day depending on weather conditions. 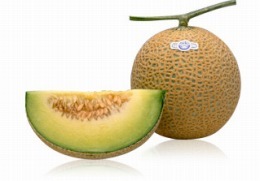 Crown Melons have become established as a brand of the highest quality, and are popular as gifts. With the collapse of the economic bubble in the 90s, Crown Melon prices also declined, and the number of melon farmers declined to one third of peak numbers. With prices having declined despite the time and effort necessary to grow them, there were less young farmers entering the business, and the average age of melon farmers continued to increase. 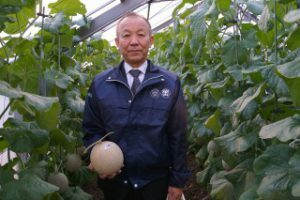 In order to encourage young farmers to enter the business, melon farmer and Shizuoka Greenhouse Farm Co-op Branch President decided to find new markets in order to make it into a business which would be profitable for young farmers. Since 2016, exports have begun to Hong Kong, Taiwan, Singapore, Thailand, and Malaysia. As a result, exports around Chinese holidays such as the Lunar New Year have increased by around 50%. Also, by turning damaged fruit into purees he has also begun developing a sales channel for processed goods. His efforts bore fruit, with six people in their 30s returning to take over melon farms over the course of 2017. ◆The tour will visit the Shizuoka Greenhouse Farm Co-op Crown Melon Branch and speak with Branch President and melon farmer Mr. Chujo about overseas exports and selling processed goods as a strategy to encourage young farmers to enter the business, as well as speaking to a farmer in his 30s who returned to take over the family business. 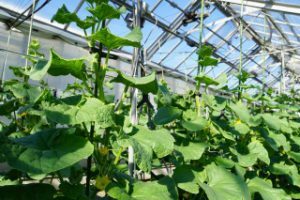 There will also be an opportunity to film and photograph melons being grown in greenhouses. 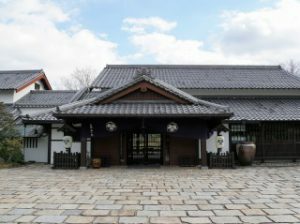 One of Fukuroi’s most famous sites is Kasuisai Temple, a Soto Zen Buddhist temple founded in 1401. This famous temple is known for being very open to the public, despite many monks continuing to train here. Visitors can practice zazen meditation along with the monks in training. Overseas visitors have also come to find release from their busy daily lives. Another unique feature of this temple is its shojin ryori. Following Buddhist teachings, not only are no animals or fish used, but plants are also used with no waste to respect their lives as well. 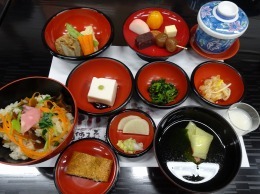 Shojin ryori came to Japan from China around 800 years ago, and since it is made based on the concept that health begins with your diet, it could be called the ultimate health food. 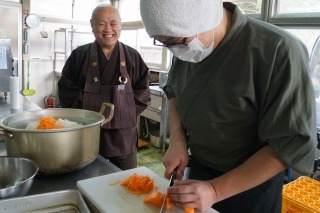 A priest who is well-known as a shojin ryori chef holds cooking lessons attended by many people. 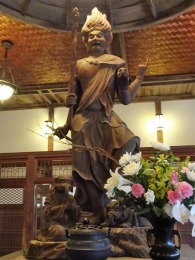 Another interesting part of Kasuisai Temple is that it has the largest Ususama Myo-o statue in Japan, in a bathroom. Ususama Myo-o is a god of fire, who cleanses impurity, and so in Japan is worshipped as a god of the bathroom. The entire building that includes this bathroom is a nationally designated Registered Tangible Cultural Property. Kasuisai Temple celebrates Hina-matsuri (a doll festival) from the New Year until early April. 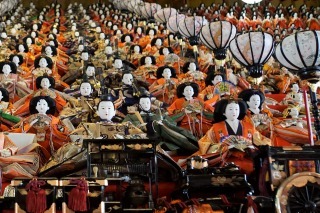 The display of 1,200 dolls which have been sent from all over Japan for last rites is an impressive sight. ◆The tour will visit Kasuisai Temple, experience zazen meditation, film and photograph shojin ryori being made, and then eat shojin ryori. There will also be an opportunity to film and photograph the god in the bathroom and the 32-level display of 1,200 hina dolls. 4. Participants: Limited to 5 applicants. *If the number of applicants exceeds 5, an upper limit may be set on the number of participants from each country/region. (2) Fukuroi City and FPCJ will not be liable for any inconvenience, trouble or accidents that might occur during the tour.